Colors are personal psychological experiences that can be generated from various kinds of stimuli, most commonly lights of a specific spectral composition. They are taken to represent a continuum, transitioning within it in various ways. Similar to all perceptual experiences they are subjective and depend strongly on illumination, surround and a number of other perceptual phenomena. A significant amount of work has been extended to elucidate how humans perceive color. Our aim is to determine the degree and possible causes of variability amongst a group of observers, in repeated trials and based on variations in age, gender and experience in assessments of color difference. Another interest lies in the determination of variations in observers’ selection of unique hues (red, yellow, green and blue). We also aim to determine the minimum number of observers required to determine the global average color difference observer. Color discrimination ability of observers has long been the subject of experiments and discussions. 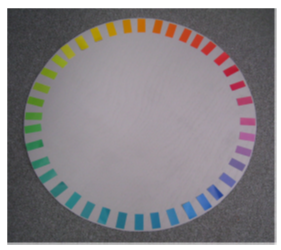 The assessment of differences in color between two materials (e.g., a standard and a laboratory or production trial) is of fundamental importance in industrial settings and a subject of interest to vision and color scientists. There is significant variability in judging small color differences between colored samples among human observers. Very little information is available concerning the range and magnitude of variability among observers based on a systematic study. Existing visual data, used for the development of color difference formulas, include a variety of experimental settings that prevent an accurate determination of observer variation specific to assessment conditions. A key aspect of our work is to establish a reliable method for visual assessment of samples containing small to medium color differences that produce the smallest variability among a statistically valid set of observers. We have shown that the assessment of small to medium color differences of textile samples based on the use of perceptually linear gray scale decreases variability within a set of color normal subjects. We aim to ascertain the variability in visual data among subjects from different regions of the world under highly controlled conditions of observation. This variability may then be used to determine the maximum possible performance of a predictive color difference formula. Most studies of visual assessment of color difference involve color normal subjects that are inexperienced in any industrial color difference assessment. However, in practice, “experts” in visual assessment and color measurement (those with significant experience in making small color difference judgments in industrial settings) are employed to make visual evaluations as part of color quality control. The experience of subjects in the development of visual datasets is potentially significant. A novice subject is defined as a color-normal assessor with no prior experience of commercial pass/fail color difference assessments. An expert is defined as a color normal assessor whose employment involves, or has involved, commercial shade matching or color quality control in the industry. 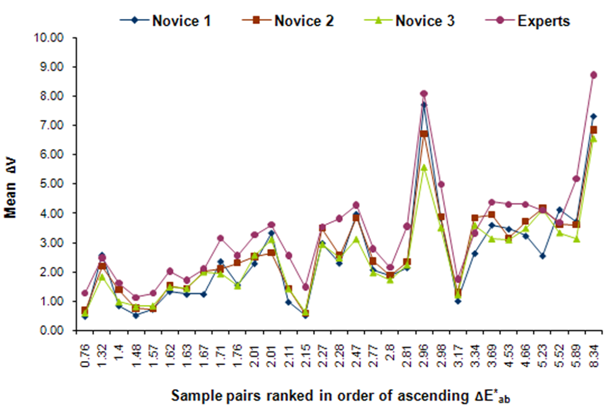 In the absence of color difference models that fully account for large perceptual variability between subjects, and based on the results of a series of experiments we reported elesewhere [JOSA A (2010) 27 (6), 1482-1489], we find that either novice or expert assessors can be used for development of small color difference datasets. However, since there is currently no standard expert visual color difference assessment training program within or across color-using industries, our preference is to use a sufficiently large set of novice subjects that do not have the potential for commercial bias. A good working protocol is to develop a highly controlled visual methodology with at least three repetitions, and to test for significant changes in repeatability and accuracy between trials. We have compared the visual assessment of small color differences by novice subjects to that of experts using a gray scale method. In a controlled psychophysical method we found that judgments made by novice subjects on average tracked well those made by expert subjects. Experts, however, on average produced 43% higher visual difference ratings compared to novice subjects. Results of variance components analysis to determine the root causes of variability showed that several factors affect the visual assessment between both groups of subjects. We aim to determine the root causes of variability amongst expert and novice subjects. The human body undergoes change as it ages and this includes changes in the optical apparatus and pertinent sectors dealing with the construction of retinal image. Variations in the macular pigment in different eyes as we age also contribute to the overall color vision variability amongst humans. Constant environmental changes, eye growth, and age also change the corneal topography as the subject ages. As the eye ages, the prevalence of positive spherical aberration tends to increase. 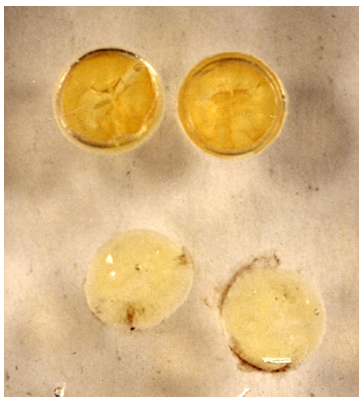 It is reported that the lens and the cornea mutually compensate for the aberrations that the other imposes, but it is suspected that this balance is disrupted by the changing properties of each element as age increases. The figure below shows the lens of 79 yr old (top) looks yellower than 39 yr old and absorbs most of the UV & some of the blue light. We have conducted a series of experiments, to be reported, and compared the evaluation of small color differences by a group of young and elder subjects and determined that significant differences exist between two groups. Hering posited three perceptual opponent pairs of colors (Urfarben): white and black, yellow and blue, and green and red, in terms of which any color experience can be described. The hues of the four chromtic colors are usually referred to as unique hues (UHs). Hering’s concept of four psychological hues, for people with normal color vision, from specific binary mixtures of which all other hues are composed, is widely if not universally accepted. In the perceptually continuous circle of hues there are four that are exceptional and elementary in that they only resemble exactly themselves and no other hues. Unique red (uR), for example, is a red hue that is perceived as having neither a yellowish nor a bluish cast, and comparably for the other three unique hues. A color order system and atlas based on the concepts put forth by Hering is the Swedish Natural Color System (NCS), which is in wide use today. Recent direct determinations of the location in the spectrum of the other three hues considered to be unique showed that individuals differed considerably in their selections, with the biggest deviations in green. The figure above on left shows samples used in the assessment of unique hues based on Swedish Natural Colour System samples. In a mental matching experiment subjects, presumably unavoidably, use their past experiences with color matching of stimuli, both by subtractive and additive processes, to develop answers. As a result their answers in regard to matching uHs can vary considerably. We are interested in determining the causes and the degree of variability among color normal subjects when selecting unique hues using object color. 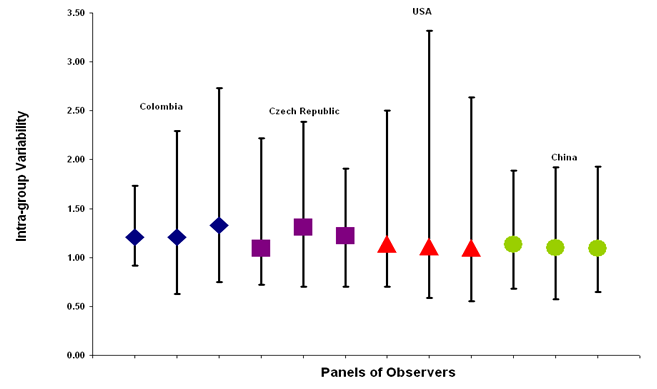 The figure on the left shows the range of samples selected by a group of 30 observers (15M, 15F) as representing UHs to them. Unique hues are used in color appearance models to predict the hue of a stimulus when compared with defined stimuli that represent them. CIECAM02, for instance, defines unique hues based on the Swedish Natural Colour System (NCS) selections. In a previous publication we pointed out that there could be significant variability in the mean stimuli that represent these four hues as shown in the figure on the right.